4' 8" x 7' 5"
An allover design of hexagonal medallions repeats in glorious color across the field of this exciting antique Turkish kilim. Within each medallion is a smaller hexagon with finely articulated hooked arms or branches. Serrated ‘ashiks’ fill the diamond-shaped interstices between the medallions, with horizontal ‘antenae’ at the sides of the field. The interior color of the medallions varies from lavender to ivory, blue, and gold, arranged in pairs. The elaborate gold-ground border has complex figures, some upright, some inverted, thought by some to be abstract representations of a ‘mother goddess’ in a large skirt. 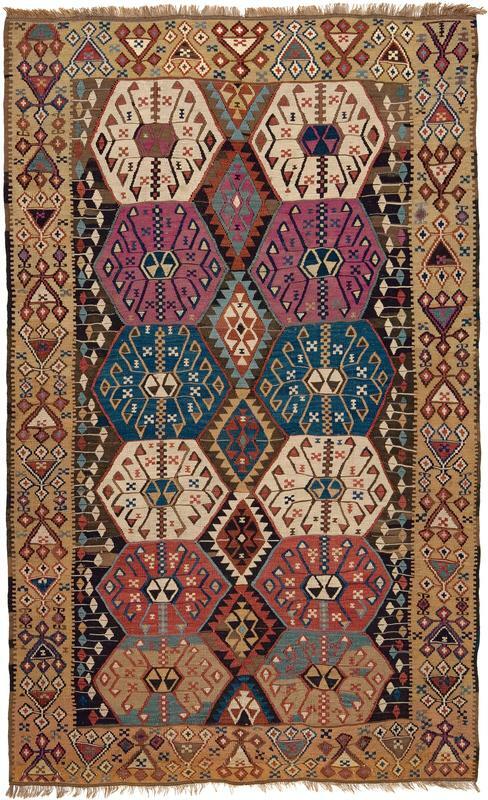 They are most likely stylized renderings of flowers or palmettes, rendered with the inimitable geometric sensibilities for which the weavers of such kilims are now so widely appreciated.